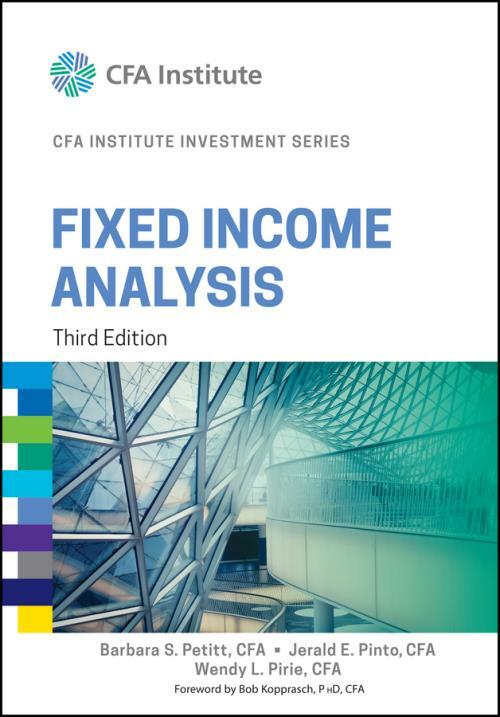 Now in its third edition, Fixed Income Analysis offers authoritative and up–to–date coverage of how successful investment professionals analyze and manage fixed–income portfolios. With contributions from a team of financial experts, the text is filled with detailed information from CFA Institute and contains a comprehensive review of the essential topics in the field. Fixed Income Analysis introduces the fundamental concepts of fixed income and provides a thorough analysis of risk, asset–backed securities, and term structure analysis. The book contains a general framework for valuation that is designed to be accessible to both professionals and those new to the field. The authors also include examples that help build the knowledge and skills needed to effectively manage fixed–income portfolios. Fixed Income Analysis gives a real–world understanding of how the concepts discussed are practically applied in client–based scenarios. Investment analysts, portfolio managers, individual and institutional investors and their advisors, and anyone with an interest in fixed–income markets will appreciate this accessible guide to fixed–income analysis.